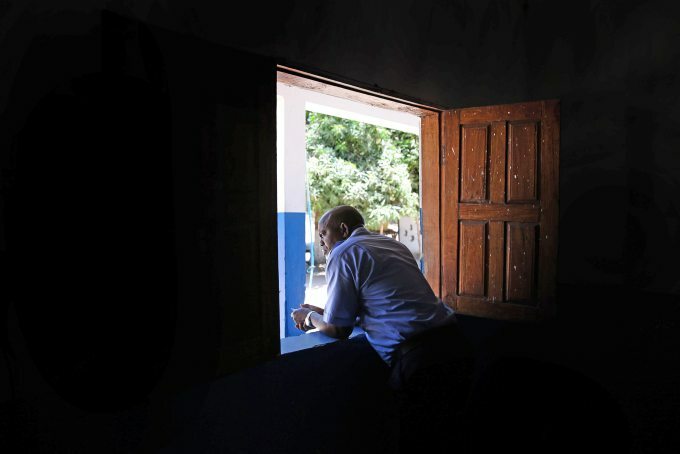 A Guinea-Bissau customs official looks out his window near the border of Guinea-Conakry and Guinea-Bissau earlier this year. The prime minister of Guinea-Bissau last week ordered the border sealed in order to prevent the spread of Ebola. HOW DOES THE WORLD STOP THE EBOLA EPIDEMIC? It’s a deadly disease with a fatality rate of 60% to 90%. But it’s also a virus that can be contained – if you have a functioning medical system, an educated population and a stable government. The virus is not airborne, so efforts such as quarantines, health education and a strong corp of indigenous doctors would be enough to stop its spread. In developed countries, an Ebola outbreak would be quickly snuffed out. But in West Africa, one of the least developed regions in the world, basic counter-measures aren’t working. After years of wars and instability, Liberia, Sierra Leone, and Guinea-Conakry (which shares a long, porous border with Guinea-Bissau), are all struggling to contain the virus. A lack of medical infrastructure, skilled physicians, and a low level of education makes the job almost impossible. To attack the root cause of such epidemics, it’s not just a medical solution that is needed. In the long run, we believe that political stability, education, and a trained population are the best counter-measures. We pray for a quick end to the Ebola epidemic. Meanwhile, we continue to work hard to prepare Guinea-Bissau for its future, knowing that the investment we are making in young men and women today to be leaders of tomorrow – in government, business and society – will ultimately be the best way to prevent such crises in the years to come. Join us. In Guinea-Bissau there have been no reported cases of Ebola so far. But just across the border, Guinea-Conakry (commonly referred to simply as Guinea) has suffered hundreds of deaths from Ebola. As a precautionary measure, Guinea-Bissau’s new prime minister, Fresno State University graduate Domingos Simões Pereira, announced last week that he was closing his country’s borders with Guinea-Conakry, one of only two countries that border Guinea-Bissau. “It is obvious that when the countries around us, such as Guinea, Sierra Leone and others already have a presence of this disease, Guinea-Bissau cannot rest and think that it is not at risk,” Pereira told local media. The prime minister has also called on civic groups and the media to help raise awareness about Ebola and educate the population. He is appealing for funds from foreign donors to help contain the epidemic and to finance a contingency plan. Portugal, the country’s former colonial power, has already shipped 15 tons of medical supplies to Guinea-Bissau. Please continue to pray for West Africa, Guinea-Bissau and its prime minister. Written by Chris Collins, WAVS Executive Director. Contact Chris at chris@WAVSchools.org.